You already know how great teas are for you, and herbs are no different (in fact, a lot of teas are made from herbs). Beyond adding flavor and depth to food—without adding calories (bonus! )— herbs are known for their highly concentrated doses of beneficial nutrients and have been used since ancient times to treat everyday ailments like insomnia, nausea and joint pain. Some, like holy basil, are even being studied as cancer-cell killers. 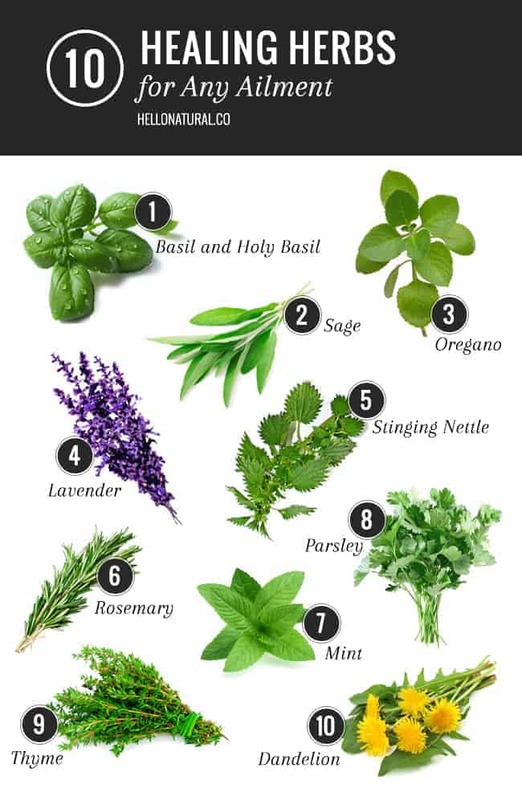 Add this healing herbs list to your garden…or at least to your meals! There are few things better than the smell of fresh basil in the summer. In addition to making lovely caprese salads, vitamin K-rich basil is anti-inflammatory and anti-bacterial. Eat it raw whenever possible (versus letting it simmer in marinara) so the beneficial oils are still intact. Holy basil is a slightly different strain of the basil we’re used to seeing. This one’s used more for medicinal purposes, including stress relief, cardiovascular treatment and inflammation. I love Organic India’s Holy Basil Tea (it can also be taken via a capsule) for relaxation at the end of a stressful day. Sage is known as a purifier, which is why it’s used in smudge sticks to cleanse the energy in a space. It’s also being studied for the treatment of memory function (and even Alzheimer’s) and high cholesterol. I’m obsessed with Greek food, so I put oregano on everything. And I’m glad I do: It supports the immune system and the oil of the plant is often used to treat upper respiratory infections (and as a natural hand sanitizer). Oregano is antibacterial, anti-fungal and anti-inflammatory…and apparently has 42 times the antioxidants of apples! Everybody loves lavender, which is good because it’s an all-purpose herb! Perfect in smoothies, as part of a natural hand salve or an insomnia treatment, lavender’s soothing, relaxing scent can calm the most tightly wound among us. You know that annoying weed that pops up in the yard, and stings you when you try to pull it out? Generally used as a tea, but also in food, the leaves (not the prickly part!) of stinging nettle are actually a detox dream that are used to clear out the liver, soothe achy joints and combat seasonal allergies. Harvest them right from your lawn and use them in this healthy omelet recipe, or mix up a batch of DIY antihistamine tea. If you live in a dry, sunny climate, you can grow rosemary to spare. This unique-smelling herb isn’t just ideal for cocktails and soups, it’s great for stomach upset and helps stimulate your digestive and circulatory systems. It also stimulates hair growth and will repel bugs when planted outdoors! Mint is definitely a multi-tasker. It helps with digestive distress, nausea, headaches, cough and fatigue, to name a few things. Eat it in salads (feta-mint-black olive is a great combo), desserts, smoothies, or steep a few leaves in hot water to make a stomach-soothing mint tea. Mint is really easy to grow, but be warned that it will overtake other plants—so keep it in a pot. No longer relegated to lowly garnish status, parsley is proving itself as a nutritional powerhouse. Its plethora of vitamins and minerals (especially antioxidants and folic acid) make it a great addition to juices, salads and pestos. Use it to help treat dark circles and eye puffiness, too. A member of the mint family, immune-boosting thyme is a cough remedy and an active ingredient in homemade elderberry syrup. Thyme tinctures have been shown to fight acne (sometimes better than benzoyl peroxide) and the herb is thought to lower blood pressure as well. Yet another yard weed (although a pretty one), the leaves of the dandelion flower can be eaten or juiced, or taken in capsule or tea form. They cleanse the liver and even help with PMS symptoms. Going through your brilliant blog has surely provided me with merely the facts that I actually required. a blog that provides all the facts which i want. Yes, Natural herbs are the best choice to get rid of your face beauty issues. I enjoyed reading the article. I have been drinking Dandelion root tea and I really love it. Keep sharing more such posts.